I was practically kissing my Rocna every morning until I discovered the horrible news!!! A bent shank!!! Photograph kindly stolen from a very good blog at Sailinggromit. It appears that Rocna's production moved to China where all the high quality steel is reserved for making more important objects. What the hell could be more important than an anchor? Some people will do anything to make a few more pennies, it's disgusting I tell you. Practical Sailor magazine put the anchor to the test by bolting a 10-kg Rocna to a concrete floor and applying side force to the shank. 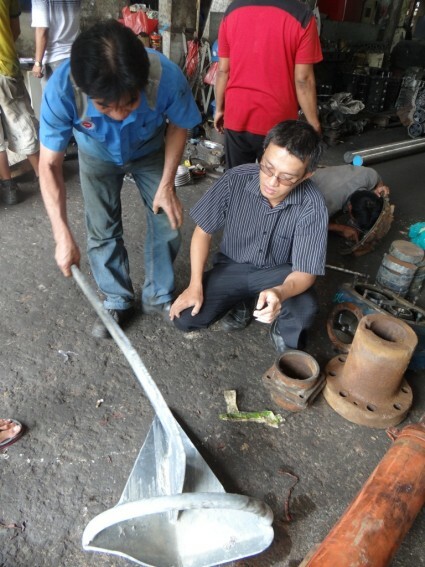 It bent 15º at 230 kg of load. From this finding they mathematically deducted that it would take a 500-kg load to bend the shank of a 25 kg Rocna. But they didn't mention whether the Rocna they tested was made in China or Canada. After stumbling onto this dirty little secret, I wasted hours sweating it out in boating forums, such as Cruisers Forum, reading about "the horrors of buying a "Chinese" Rocna. Forum junkies go really nuts when discussing anchors and anchoring; the topic seems to transform placid sailors into vicious dung-throwing warriors. Have a look for yourself. Then I checked out a reputable site Attainable Adventure Cruising where very experienced sailors repeatedly state that Rocna is God's gift to boaters, regardless of the fact that an unspecified number were fabricated with inferior quality steel some years ago. "Some years ago" has a sweet sound to it; I bought my anchor 2 weeks ago. Time to step out of the house and into the real world where life - as opposed to Internet life - is much more satisfying. I went for a walk along the beach promenade and came across this amusing graffiti. During a two-day trip to visit traditional villages in the center of Portugal, I got a phone call from a friend. "Did you buy the anchor yet?" "No, there's plenty of time before I sail south." "If you're interested, I'm in a shop in Ayamonte looking at a Rocna 25 and I really feel like buying something...with somebody else's money." The price was good, the shipping was free, so why not? The Rocna 25 (55 lbs) next to a 5 l oil container for perspective. It's massive and beautifully ugly. I love it! Don't know if it will fit the bow roller. What really matters is that it doesn't drag in a blow. And now some trip photos. Yeah, I know, this is supposed to be a sailing blog...but it's winter. Standing by the Pelourinho where "criminals" were once publicly punished. Taking the notion of ornamental rocks a bit too far. Typical houses in Piódão deep in a valley. Hike up the castle of Monsanto. Can you see the turtle? In the last village, there was no restaurant. Luckily we found this community bakery that sold us a huge bread loaf and an equally gigantic goat cheese. Removing loaves of bread from the wood furnace. Stork nest. Storks are everywhere. Although they're mute, you can hear them clacking their long beaks from quite a distance. I've had a lot of big ideas in my life; I've also had my share of ups and downs. One of my favorite plans so far was to stop working today - yes today! Life would be grand anchored someplace...like here. 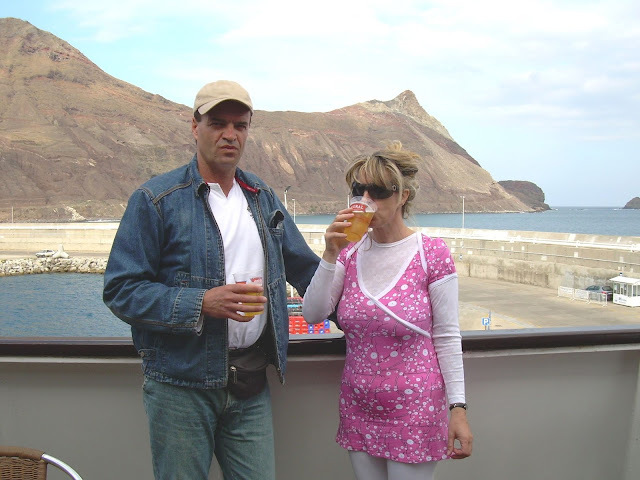 Having a drink on the Porto Santo Ferry about 4 years ago. I look like I'm drinking lemon juice. Ana has since lost the little tummy through persistent jogging, cycling and gym sessions. But I like the picture anyway. During our visit to Madeira, we took the ferry to the smaller island of Porto Santo, which reinforced my fondness for dry arid landscapes surrounded by ocean - preferably bays and beaches. I've heard that a cold rainy climate has its practical and poetic virtues and is also a stimulant for an industrious mindset. I believe it because I've been a pack mule a good part of my life, except when I was busy being a book-reading dreamer and a bum. Regardless, I don't want to work anymore. I'm now totally ready and willing to waste my time doing something worth doing in a warm, sunny setting - I'd rather sweat than shiver. Back to reality and to Jeep news: as I head into the third week of waiting for a stupid little engine part, the mechanic decided to have a local machinist manufacture it "Cuban-style." Don't ask me about the boat. I haven't been there since the storm and it must look odd all lashed down with extra storm lines in this calm weather we've had lately. I was going to take the bus into Peniche yesterday but didn't when an unexpected situation popped out of nowhere. Man, sometimes I feel like I'm moving but going nowhere.